Marguerite Bilms presents Object Schedule Systems which can be developed and used at home or at school. She describes the benefits of schedule systems as developing literacy skills, concepts, memory, and expressive and receptive communication. Bilms is a teacher in the Deafblind Program at Perkins. BILMS: Hi! My name is Marguerite Bilms and I am here today to talk to you about object schedule systems and how to use them in your classroom or in your home. An object schedule system is for learners who are learning at a concrete level of development, so they are pre-symbolic in their understanding of words an how they correlate to individual activities or individuals. There’s a variety of ways that you can use an object schedule system. This system, in particular, was developed for a four years old who is a deafblind learner and is still learning at a concrete level. Meaning, that they are still understanding what objects mean and how they relate to activities that have further, abstract meaning. There are many benefits to using a calendar system, in that it’s pre-literacy. You’re building concept development, you’re helping the child develop memory skills and overall communication-both expressive and receptive. When you’re considering how to develop your own schedule system, you need to first think of what objects are meaningful to the child. I cannot emphasize that enough — that it must be meaningful to the child and the adult or the teacher must be conscious not to implement their own bias when picking out objects. One of the biggest issues is using miniatures when talking with our children. If you are telling a child that they are supposed to go “in the car” or “on the bus” and you give them a miniature car, they don’t conceptually understand that this small car means the big van that they get into. 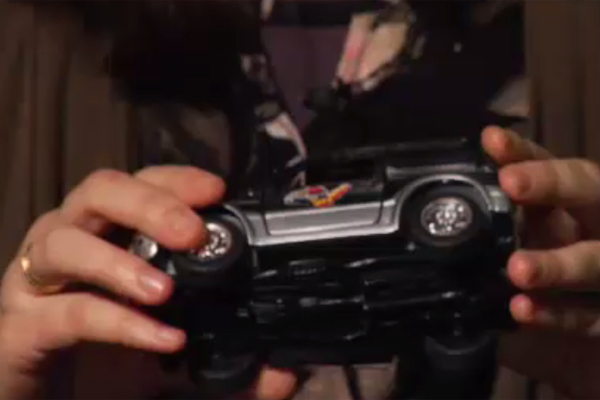 NARRATOR: In her hands, Marguerite holds a toy car. The car is black and silver, with a red and yellow decal. BILMS: They don’t have experience with feeling the whole car or seeing the whole car, they have the experience of stepping into the car and sitting in a car seat. So if you’re thinking of something that’s meaningful to the child, think of something they use in that moment that they can associate. Naturally, you can’t put a big, large van into the child’s schedule system, but you can use a piece of a seatbelt, you can have a toy that’s only consistently used in the car, or maybe they have a preferred blanket. Those are some options to consider. So when you’re selecting objects to implement throughout the day with your child, I like to start with objects that I use consistently and routinely, usually surrounding recreational activities, or mealtimes, or toileting. This way, the child gets consistent exposure and repeat exposure. When you want to start expanding on which objects you use with your children, you want to start at a concrete level. Meaning, if the child eats out of this blue bowl for a snack everyday, this is the blue bowl that you should be using in your calendar system. NARRATOR: Marguerite has just picked up a small, blue, plastic bowl. Off to her right, there is also a larger plate, made of yellow plastic. BILMS: It becomes more symbolic when you have the student reference a bowl, then eat off a yellow plate. So you want to avoid that at first. You want to make sure that the student understands the correlation between one object and using that exact object in the moment. Not just using it as a point of reference. In further discussing how meaningful the object should be to the child, consider how they experience their own activities on a day-to-day basis. If the child eats by mouth and they use a spoon, then that’s great! That a great symbol to use for them but then consider, are they a g-tube user? If they use a g-tube, then the spoon may mean nothing to them. So maybe it’s something involving a g-tube. NARRATOR: In her left hand, Marguerite holds a spoon and a large feeding syringe in her right hand. BILMS: You want to use these objects consistently, throughout the day, at any point of reference that you can. Even if you don’t have a system in place yet, you can still bring the object to the child in the moment and have a conversation about it. Also, consider what language you use when you’re working with your children to make sure you have consistent labeling. So, do you refer to this as a “snack time bowl”, a “bowl”, “your blue bowl”, “your round bowl”? What do you call it? Whatever is meaningful to the child is fine, as long as you remain consistent so that you’re using the same words that maybe another teaching assistant, teacher or educator will be using with the child. Once you’ve determined which objects you’d like to use with your child, you can then start thinking about the system. NARRATOR: On the desk, to her left, is the calendar system. 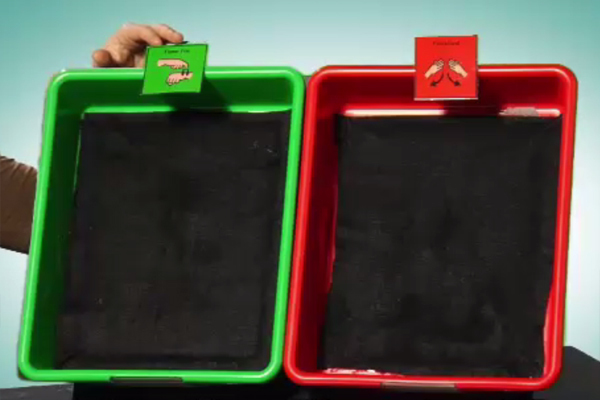 It consists of a green, plastic bin and a red, plastic bin, side-by-side. Both of which are lined with black Veltex. A Meyer-Johnson picture communication label illustrating the “time for” sign is at the top of the green bin, and the picture communication sign depicting the “finished” sign is on the top of the red bin. BILMS: You can either have a traveling schedule system or you can have a scheduling system that is in a set location that the child can routinely access and in a predictable environment. Initially, you don’t want to over-complicate the system., as the student is still learning how to use it. What’s the meaning of it and how to implement it. So, we have a green start bucket and as you can see, I’ve put a Meyer-Johnson symbol that says “Time for” on the top. This is not meant for the student to understand or access, it’s for the educators to know which language to use when using the box. So, we have a “Time for” bucket and then we have a red, “Finished” bucket. The colors matter because this student has some residual vision and can identify colors. Or at least, recognize colors. If the student is totally blind, you might want to consider using boxes of different texture, different sizes — something to help differentiate the “Time for” and “Finished” bucket. If the child has a field loss and has a preferred field of vision, you might want to consider the angle that the box is at so that they can most easily identify the object that’s in the boxes and then access it with ease. So, now that you have your objects in place and you have the system in place, how do you use the system? What you do is you have the child approach the system with you. Once they arrive, you should have the object in the “Time for” bucket and ready for them to access. So as the student approaches, you have them reach in, to the best of their ability, and take out the object. NARRATOR: In this case, the object is the book, “Goodnight Moon”, which Marguerite now displays. BILMS: It’s important to give them communication when you’re discussing the schedule system. So, you can sign to the student that “it’s time to go read a book” and I want to reiterate that, this being a concrete object, meaning this is the book that you’re going to read. So we’re not bringing this book over to the book area and reading “The Hungry Caterpillar”, we’re going to read “Goodnight Moon”. Once that activity’s finished, you want to make sure the object for the next activity is readily available so that the student can access it immediately. In this case, I have a swimsuit. So, “we’re going to go swimming” and this is the child’s exact bathing suit. This is the bathing suit that the child will swim in. So we’re making sure it’s concrete and not symbolic. NARRATOR: The bathing suit is placed in the green, “Time for” bin, waiting for the student and her next activity. BILMS: So it’s already in the “Time for” bucket, so the student reaches in, removes their bathing suit, we have a conversation (“it’s time to go swimming”) and we continue to repeat the sequence as much as is appropriate for the child. We always want to make sure to go from left to right, because this is pre-literacy skills, we want to start that left-to-right process, that motor-planning. It’s very important as, down the line, our schedule systems might increases and they will always go from left to right. If a child’s not physically able to carry their items independently, there’s a variety of ways that you can adapt. You can have them carry it in a bag, they can carry it with your support, or you can carry it for them and just keep talking to them about the object as you travel. So even if they can’t hold their bathing suit, I can hold it and say, “I have your bathing suit! We’re going swimming!” and let them reference it throughout your travel. It’s important to realize that while this schedule system was designed for a 4 year old, that doesn’t mean it’s only appropriate for a 4 year old. It’s for any individual that’s learning at a concrete level. So you want to make sure that the student’s able to access their environment and communication to the best of their ability. You also want to make sure that the student has a strong foundation of concept development before you move on to the next step in symbolic understanding. The length of time it takes for a student to master their object schedule system depends on the student. There is no set time. Ultimately, we want to make sure the student understands objects in a variety of forms before they move on to the next level of abstract learning. And that’s today’s Teachable Moment!